Khamenei said Iran had no intention of curbing its influence in the Middle East. “Tehran will attack 10 times more if attacked by enemies… The enemies don’t want an independent Iran in the region… We will continue our support for oppressed nations,” he said. Khamenei said Iran had no intention of curbing its influence in the Middle East and urged Arab youth to stand up to US pressure. “Young Arabs, you should take action and the initiative to control your own future … Some regional countries act like their own people’s enemies,” he said in an allusion to US-allied Gulf Arab states who have supported rebels fighting to topple Syrian President Bashar al-Assad, a close ally of Tehran. European signatories are scrambling to save the accord, which they see as crucial to forestalling an Iranian nuclear weapons, by protecting trade with Iran against the reimposition of US sanctions to dissuade Tehran from quitting the deal. Under the deal, the Islamic Republic curbed its disputed nuclear energy program and in return won a lifting of most international sanctions that had hobbled its economy. One of Trump’s demands – which European allies back in principle – is negotiations to rein in Iran’s ballistic missile program, which was not covered by the nuclear deal. 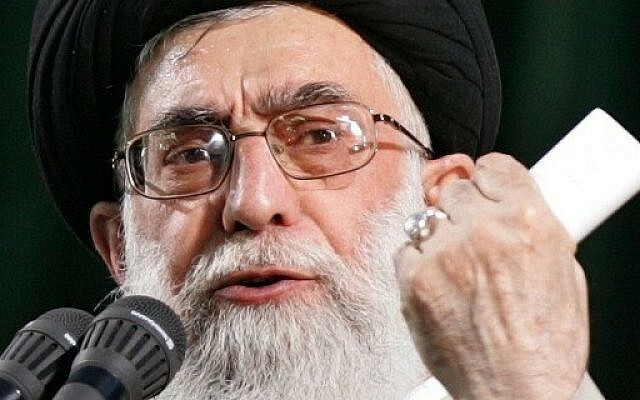 Iranian Supreme Leader Ayatollah Ali Khamenei again said this was non-negotiable. “Some Europeans are talking about limiting our defensive missile program. I am telling the Europeans, ‘Limiting our missile work is a dream that will never come true,” he said in a televised speech. Trump also objected that the 2015 deal did not address Iran’s nuclear work beyond 2025 or its role in conflicts in Yemen and Syria. Though committed to the deal, European powers share Trump’s concerns and want broader talks with Iran to address the issues. “Our enemies have staged economic and psychological… warfare against us and new American sanctions are part of it,” Khamenei told a gathering to mark the 29th anniversary of the death of Iranian revolutionary leader Ayatollah Ruhollah Khomeini. This entry was posted on June 4, 2018 at 8:41 PM and is filed under Tehran. You can subscribe via RSS 2.0 feed to this post's comments. You are fighting the one and only God – the God of Israel ! Either you change your mind or HE will destroy you ! But Israel is kept safe in HIS almighty hands ! I hope for the normal good Iranians overthrow their oppressive abusive gov. I think they will need more help then prayers after all w all d good intentions of the normal good Iranian citizens they don’t hv guns or weapons to overthrow the gov. who has all the guns and weapons.